Prominent & Leading Manufacturer from Chennai, we offer skf kaydon bearings, fag kaydon bearings, nsk kaydon bearing, timken kaydon bearing, kaydon slim bearing and ina kaydon bearings. we skf apply engineering experience and expertise to solve the world's most demanding bearing challenges. Kaydon solutions meet the most exacting specifications of the aerospace and defense, commercial aerospace, heavy equipment, industrial machinery, medical systems, mining, oil and gas, renewable energy, and semiconductor manufacturing markets. Kaydon Bearings is celebrating its 75th Anniversary! Find out how the company started and learn about some of our key achievements over the last 75 years. At Kaydon, we apply engineering experience and expertise to solve the world's most demanding bearing challenges. Kaydon solutions meet the most exacting specifications of the aerospace and defense, commercial aerospace, heavy equipment, industrial machinery, medical systems, mining, oil and gas, renewable energy, and semiconductor manufacturing markets. Kaydon thin section bearing solutions save weight, create space, reduce friction, increase design flexibility, and provide excellent running accuracy. 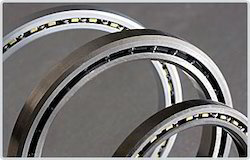 Kaydon Reali-Slim® and Ultra-Slim® bearings are available in a wide variety of materials, separator options, cross-sections, internal fit up choices, lubricants, corrosion resistance options and contact angles. 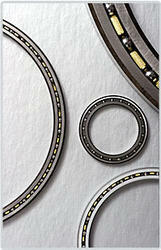 With bore sizes from 1 inch to 40 inches (20 mm to 1 m), Kaydon provides the largest range of thin section bearings. The Kaydon bearing selector lets you the search our thin section solutions by dimensions or part number. 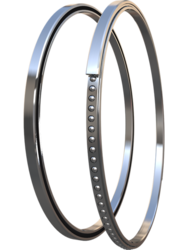 A deep groove thin bearing with reduced shoulder on one side of inner/outer race ball path.Snapover assembly permits using of a one---piece circular pocket ring separator and greater ball complement.Type A bearings require the application of thrust to establish contact angle.Stock bearings are individual units and when purchased as such must be adjusted at installation to desired running preload or clearance. The Kaydon thin section bearing product line includes Reali-Slim® and Ultra-Slim®; Real-Slim TT® turntable; and custom thin section designs. Slewing ring bearings include four-point contact, eight-point contact, cross roller, three-row roller, and wire-race configurations. 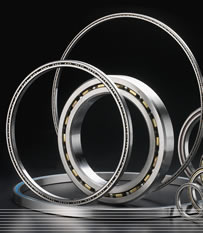 Kaydon also provides slewing ring bearing remanufacturing and replacement services. 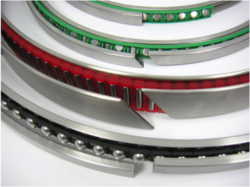 Thin section bearings can do the job of bigger, heavier bearings while reducing overall cost. They provide excellent design flexibility while meeting the capacity requirements of a wide variety of applications. Watch this short video, The Advantages of Thin Section Bearings, to find out how to use Kaydon Thinfinite® bearings solutions to save weight, create space, reduce friction, and decrease costs. Additional informative videos can be found in the new Kaydon Bearings video library and on the Kaydon YouTube channel. 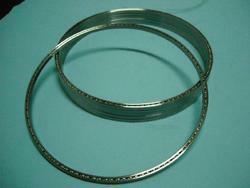 Looking for Thin Slim Bearing ?